At the beginning of February I posted a list of goals for my blog and my wizards. And guess what! I have completed all of them, except for one. I still have to finish making the last three guides for Prospector Zeke's quests, but I should have them done and posted before the end of next week. I think the hardest goal to complete was going through The Tower of the Helephant on my ice and life wizards. I would like to thank Scot Soulhammer for going through with me. I was originally going to make a whole post about the tower, but none of the screen shots I took got saved for some reason, so here is one I took after of my wizards displaying their new badges. One change I did make to my list is that instead of continuing through Mooshu right now, I am going to level Autumn Myth up in Wintertusk. I did this on my life wizard and it made questing through the other worlds much easier. I am also going to be doing some Waterworks runs to try and get my level 60 gear. I still need my ice boots and my life hat and robe from there. A couple other things I have been up to, that weren't on my list of goals. I have been working to level some of my pets. I have gotten 5 of them to epic and 3 to ancient. I am out of mega snacks and still trying to level them with rank 5 and 6 snacks, as well as gardening to get more mega snacks. It is taking forever now, but I will get them to epic eventually. One thing I wish Kingsisle would do is make separate gardening and pet energy. 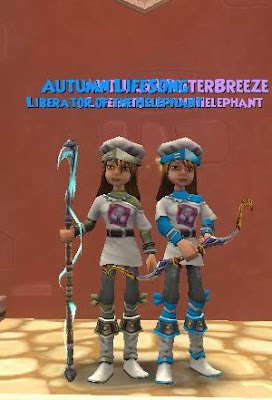 The other thing I have been doing is I started questing through Zafaria on my ice wizard with Edward Wintergem. So far we have only gotten to the Savannah, but hopefully we will be able to quest more in the upcoming weeks, so be sure to watch for some posts on those adventures. I think that's all for today. I would like to say thanks to everyone who follows and reads my blog. It really does mean a lot. :) Also, remember to check out my contest for a $10.00 W101 gift card. There are 6 days left to get your entries in. A link to the contest details can be found in the upper left corner of this page. Thanks for reading and see you next time!